QUESTION: I am 29 yrs old and a Type II diabetic, was diagnosed 6 months ago. I am taking Glyburide 2.5mg and Metaformin 500mg ,3 times a day. My fasting sugar level in the morning is between 102-110, but after I brush my teeth and wash my face, suddenly the sugar level rises about 20-30 points without eating anything. First I thought, may be it is because of my toothpaste. But I brush my teeth with the same toothpaste at night and this sudden jump in sugar level does not occur at night. 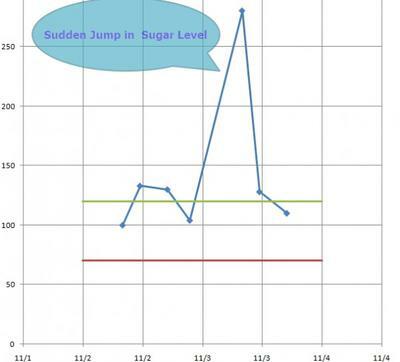 What should I do to avoid this sudden jump in fasting sugar level? At first, I want to congratulate you for the proper control of your blood glucose level, because keeping your blood glucose level between 102 and 110 mg/dl is something very difficult for a diabetic. Second, there are some factors that could lead to the spikes in the blood glucose result. 1. Hormones. When you are asleep, your body is working with minimum efforts, which means that when you wake up, your body has to start working faster and harder. This is caused by the elevated secretion of some hormones - adrenalin, noradrenalin, cortisol and others. These hormones are elevating your blood pressure, making your hard beat faster and of course raising your blood glucose level. The high blood glucose concentration is needed for energy and such elevation is physiological, which means that you are not able to prevent it. So, in this case, measuring your blood glucose level after waking up leads to false positive result - high blood glucose level. Because of this, I want you to keep in mind that you have to measure your blood glucose level before having a breakfast, but at least 30 minutes after waking up. At this moment, the effect of the hormones mentioned above, will end and you will get real results. 2. Second thing, regarding the hormones, is that they are elevated mainly in the morning and during the day and at night, their secretion is normal. You are telling that while you are brushing your teeth at night, there is no elevated hormone secretion, which can raise your blood glucose level. Keep in mind that at night, you have already taken your blood glucose medications three times and they are lowering your blood glucose level as well. 3. Something which is important for your blood glucose regulation is that the morning activities, like brushing your teeth, washing your face or shaving, require energy. So, during those activities your body tries to ensure enough energy for them, which of course leads to elevated glucose concentration. Because of this, measuring your blood sugar, right after such activities, will result with spike in the blood glucose value. My advice for you is to avoid measuring your blood sugar right after those activities and to wait at least 15-20 minutes, until the excessive amount of glucose get metabolized. 4. I want you to remember that eating a dinner rich in carbs, sometimes results, not in the evening, but in the morning with slight elevation in the blood glucose level, like yours. According to this, it would be best for you to avoid the consumption of foods, which contain too much carbs in the evening. Another important thing for you general health is that patients with diabetes in general, have your age, are overweight and they are following sedentary life style. I’m not sure if this is the cause of your diabetes, but I want you to work on this with diet and exercises. Of course, the genes, presented by family history for diabetes are playing a role in here, but those factors mentioned above are pretty important. In addition, I want you to talk with your physician about the measurement of the insulin in your urine. This is quite new and innovative test, but it can show information about your diabetes and the best way to beat it.